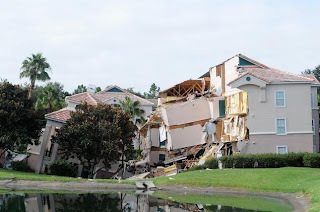 Engineers on Monday were trying to determine the extent of the damage after luxury resort condominiums crumbled into a massive sinkhole a few miles from Disney World. Dozens of guests at the Summer Bay Resort in Clermont, FL, had only 10 to 15 minutes to escape the cracking building late Sunday. No injuries were reported, but many fleeing guests left behind all their belongings. About 30% of the three-story structure collapsed hours later, around 3 a.m. Monday. "My heart sunk. I was sick to my stomach," said resort president Paul Caldwell after getting a call about 11 p.m. Sunday that the 15-year-old building full of guests was splintering. "No doubt there would've been injuries if they hadn't gotten the building evacuated," Caldwell said. Security guard Richard Shanley ran through the building waking up guests. That section of the villa housed 24 units. The building was sheared nearly in half. Paul Caldwell said one building was destroyed and 105 people were evacuated. Two other adjacent buildings were evacuated. Displaced guests were relocated to other buildings. Caldwell said geologists on Monday estimated the sinkhole was about 100 feet in diameter. "On a preliminary basis, they do not have a concern that it is growing or will grow," Caldwell said. "Whether or not we will be able to build those units there in that sinkhole is another question. We will replace those 24 units - we have a couple of hundred acres left for development," he said. Caldwell said he will ask his insurance company for guidance on the clean up.